Directions: The diagram shows a square and four semicircles formed using each side of the square as a diameter. 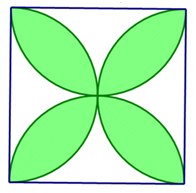 What fraction of the square is shaded? How can you partition the space to find the area you need?